Slowly working on a few lazy summer project. I bought this Bernat Handicrafter Cotton to make a dish cloth but I had a lot left. I tried making a couple more dish cloths but I still had a lot left. So I wondered whether there was enough to make a summer top with the rest. Because it’s a variegated yarn I thought a simple geometric pattern, like a diamond lace pattern, would work without obscuring the lace pattern too much. It was just going to a simple boxy sweater, I figured I would knit in the round until underarm, then knit front and back separately by knitting flat, then sew the shoulder seams, and finally knit several rounds of 1x1 rib around the sleeves and collar. So I started with knitting in the round, first in stockinette, then in garter stitch, but the pooling just turned out really weird when I switched from knitting in the round to knitting flat when I separated front and back. I guess I should’ve known that the yarn would do that. So anyway, the above picture shows that I’m back to knitting it flat in two pieces, then knitting the ribbing on the sleeves and collar in the round. Will keep you posted on how it goes! 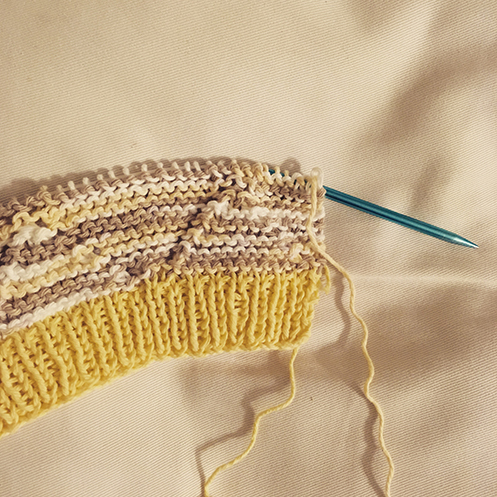 I do like the colour combination of the yarn, and knitting it flat is creating more of a striping rather than a pooling pattern, which I like better, so I’m really hoping it will work. Will keep you posted and share the pattern if it works out! Before the summer sweater I was working on a pattern from the 5th anniversary issue of Pom Pom magazine. 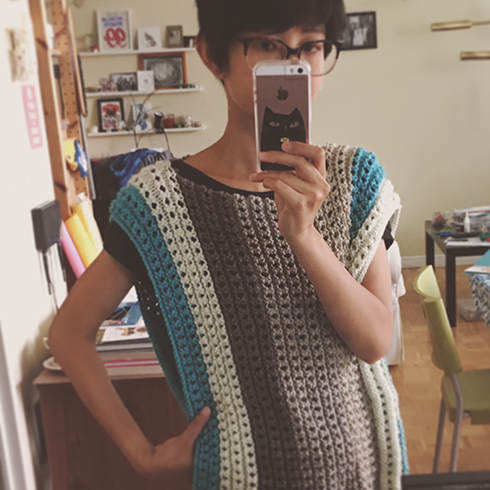 It’s being hibernated at the moment because it’s too warm to knit this. But I’m looking forward to finishing it. I love sideways sweaters. It just needs sleeves, which I will knit in the round after sewing up the side seams. Using Caron Cakes! :D I do love variegated yarn. And because a sweater is too large to knit on public transit, I started a portable project for going to and from work. I’m making some dragon hand puppets for my niece and nephew for Christmas (shh… and no, it’s never too early to start holiday crafting). 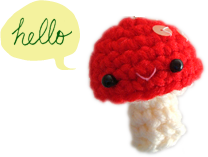 I bought a kit from my local yarn store and learned to make bobbles (a row of bobbles runs down the back of the puppet). 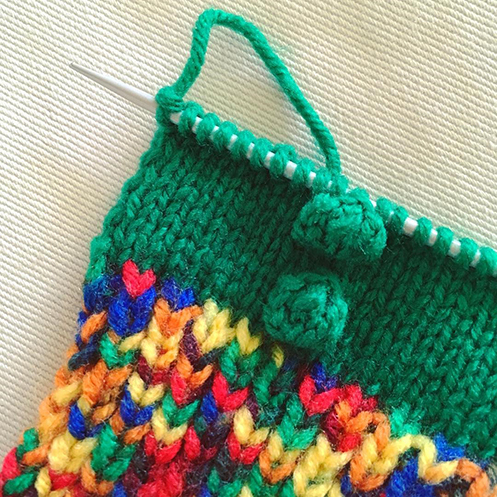 Also, short colour repeat rainbow yarn is so much fun to work with! Spot the tiny heart! Looks like I have a few WIPs but I actually did finish a custom order recently. 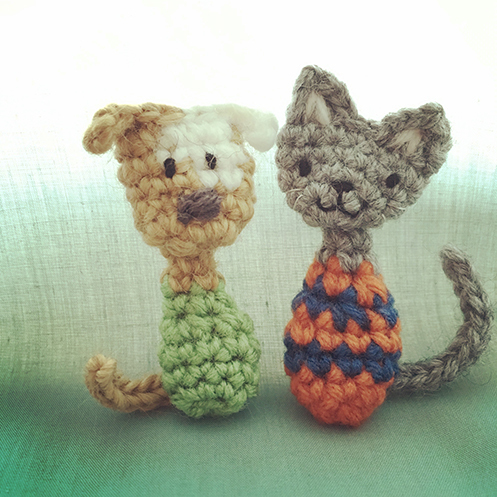 Animal friends to be part of a commemorative project, so glad I could contribute to it. Wishing you much joy and creativity for the weekend!